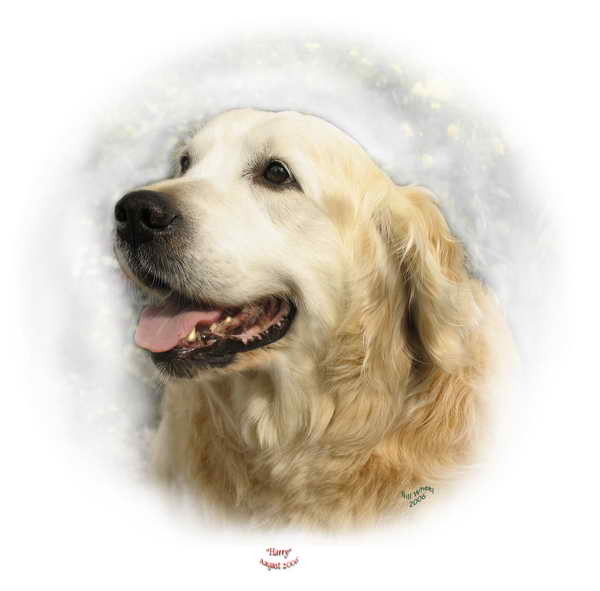 Harry and his brother Quillan have given us the inspiration to dedicate our lives to Golden Retrievers. Harry is the gentlest and softest boy in the world and, unlike his brother, he is happy to take second place at everything from food to success in the show ring. Harry has however been placed at UK Championship shows and has won Reserve Green Stars in Ireland. On a number of occasions Harry has taken BOB and at a very large UK Open show he went G2 under Liz Cartledge. Harry with his brother Quillan have won seven Brace Class firsts at UK multi breed Championship shows. We will always be so grateful to Liz and John Keene for allowing us to have Quillan and Harry and we are convinced that their perfect temperament and good manners are due to their breeding, particularly from the Muskan line which we have deliberately strengthened in our kennel.